Service King Collision Repair Centers, an industry-leading national operator of high-quality collision repair centers and one of the most trusted automotive repair companies nationwide, today held a groundbreaking ceremony for its future location in The Colony, Texas. 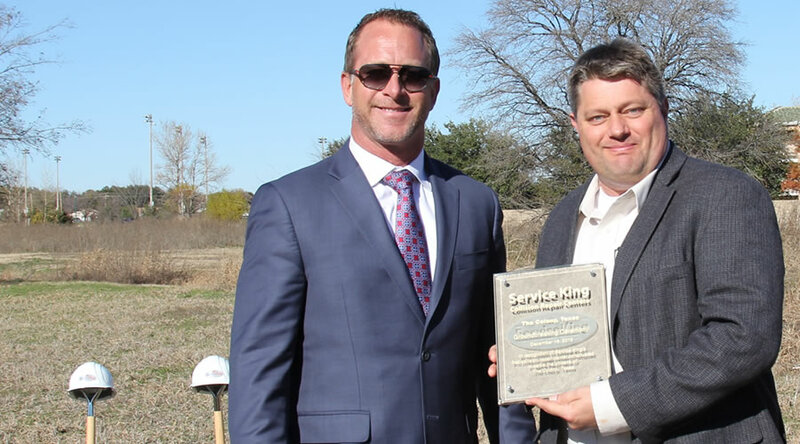 Service King officials, including CEO Chris Abraham, joined representatives from the city of The Colony to officially commence construction of Service King’s future 22,600 square foot repair center located at 5270 Memorial Dr. in the rapidly growing north-Dallas suburb of The Colony. Service King plans to open the repair center in late summer 2016. The new repair center will operate as Service King’s 35th location in the DFW Metroplex and boast the capacity to repair up to 300 vehicles per month while employing a staff of 25-30 teammates. It will mark Service King’s very first location in The Colony and the first new location to be constructed from the ground-up in the Dallas area in five years. Service King, which will celebrate its 40th anniversary in 2016, is one of the fastest growing collision repair providers in the country serving customers and insurance partners at more than 275 locations in 23 states across the U.S. The company provides all customers a written lifetime warranty valid at any of its locations, on-site rental assistance and works directly with all major insurance carriers to simplify the repair process. Above: Service King CEO, Chris Abraham (left) presents Deputy Mayor Pro Tem, Perry Schrag with a commemorative Service King plaque. Service King is one of the largest multi-location operators of collision repair facilities in the U.S., dedicated to offering customers an overall superior service experience. Founded in 1976 in Dallas, Texas, Service King is a leader in the collision repair industry, currently servicing customers at 276 locations in 23 states. In 2015, Service King was named the No. 1 Best Place to Work by both the Dallas and San Antonio Business Journals. For more information about Service King, visit www.ServiceKing.com.